The global phenomenon Mamma Mia! began its month-long residency at the Theatre Royal in Glasgow last night, bringing with it fun, music and joy. This burst of Greek sunshine is set to warm up the Glasgow winter and leave the audiences dancing in the aisles all Christmas. Guaranteed every night the "Glasgow" line in Super Trouper will be sung with gusto by cast and audience alike. First staged in 1999, the musical is based on the iconic music of ABBA with additional new songs and a book by Catherine Johnson. Directed by Phyllida Lloyd the production has been staged all over the world in a multitude of languages. 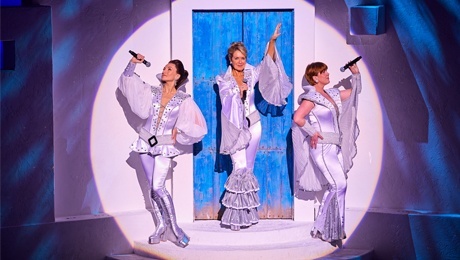 The international tour has visited the UK several times but this production marks Mamma Mia! 's first UK tour. Put the 2008 film aside and prepare to enjoy the stage production with all the emotion and pure joy (and more tuneful sorry Pierce Brosnan!) as the musical was originally intended to be seen. The young lovers Sophie (Lucy May Barker) and Sky (Philip Ryan) bring an infectious optimism to the piece setting the tone for a high energy night. Taking on the role of feisty single mother Donna Sheridan in this production is Helen Hobson. Hobson brings real depth to the role with an emotional performance of Donna. Her performance is particularly heart wrenching in the second act when her performances of Slipping Through my Fingers and The Winner Takes It All leave the audience raw. She balances this with the lighter elements creating a well rounded and relatable character. Joining Hobson in the reformed Donna and the Dynamos are Gillian Hardie as Rosie and Emma Clifford as Tanya. Hardie and Clifford provide perfectly timed and hilarious performances that create a wonderful representation of true friendship. Clifford's Tanya nails the cougar element of the role with a crowd-pleasing Does Your Mother Know? featuring some impressive moves in Tanya's wedge heels while Hardie's Rosie brings the house down stalking Bill with Take a Chance on Me. Of course the three Dads played exuberantly by Jon Boydon (Sam), Jamie Hogarth (Harry) and Christopher Hollis (Bill) deserve a notable mention. Each played their part superbly, showcasing the distinct differences between the three and it's always a treat to see Bill return to his original Australian adventurer roots. Boydon's Sam has a restless, wistful spirit that evokes a real longing for an opportunity lost alongside sweet banker Harry and stereotypical Aussie Bill. The creative set created by Production Designer Mark Thompson and Associate Set Designer Jonathan Allen, transformed quickly by stage staff bedecked in Greek costumes, transitions smoothly from taverna to courtyard and creates an imposing structure on the stage. Howard Harrison's lighting design brings the sun-kissed taverna to life creating an irresistibly sunny scene. Imperfectly perfect, Mamma Mia! is an absolute toe-tapping, joyful tonic so, escape the winter blues and book a festive break on a Greek island at the Theatre Royal, how can ya resist?